Art museums are the perfect place for students to exercise skills that are essential to achieve success in the 21st century. Bring your students to CMA for a guided learning experience that fosters collaboration, creativity, and critical thinking. Spend your day at CMA collaborating, thinking, and creating. We encourage students to practice their critical thinking and creativity as they discuss and interpret works of art. Every tour can be customized to align with grade-level curriculum and across disciplines. Tours are led by CMA docents, our highly-trained volunteers who facilitate conversations. When: Tuesday through Friday beginning at 10:00 AM. Most tours are 50 minutes. You may request self-guided exploration time to follow your docent-led tour (rules for self-guided groups apply; please read below). When possible, schedule tours October through February to avoid our most crowded period: March, April, and May. Students will investigate works of art in small groups, with docents supporting careful observation and critical thinking. Students will examine clues, carefully describe, develop interpretations, and reason with evidence – all while thinking creatively and collaboratively. This playful and imaginative tour is designed for our younger visitors. They may act out a painting or go on a hunt while exploring works of art that depict animals. Students work collaboratively to engage with works of art and explore the language of poetry. Students will have the opportunity to play with language and begin a poem inspired by a work of art. Picturebooks are often the first exposure students have to art. These tours begin with a carefully-selected children’s book that connects to works of art in our collection. Students will be inspired to compare big ideas of the story to paintings and sculpture. Explore the inside story of one of our special exhibitions. Can’t make it to Paris? Have your students explore French art at the CMA! Availability: Tuesday – Friday. For all guided tours, 1 free adult chaperone per 5 students; additional adults $4 each. Tours can be combined with a Studio Thinking Workshop. Please read below for more information. CMA welcomes self-guided groups with advance reservation. To receive the discounted group rate, please call 614.629.0342 to make a reservation at least two days in advance. Otherwise your group will be charged the regular admission fees. *These group rates apply to general admission to the Museum. There is an upcharge applied to the group rate to access special exhibitions ($2 for children 18 and under, $3 for college students and seniors, $6 for adults). The Studio in the JPMorgan Chase Center for Creativity is home base for lively and creative studio thinking workshops. Students will generate new ideas, use their imaginations, and problem solve in collaborative groups. They may be asked to tell a story, perform a sketch, or build something in response to creative challenges. Each 50-minute workshop is unique and can be adapted to desired themes. Pair a Studio Thinking Workshop with any of our 50-minute guided tour offerings. Explore: Self-guided time in the Museum is encouraged. Activities and resources to direct your self-guided time are available at the admissions desk. Explore the galleries or Imagine the Possibilities in our first-floor JPMorgan Chase Center for Creativity. Classroom Pre-Visits Docent-In-the-School visits may be available free of charge, by request, to any Franklin County classroom that books a tour at CMA. During the pre-visit, the docent will talk about what to expect at CMA and introduce students to critical thinking strategies that will be used during the tour. 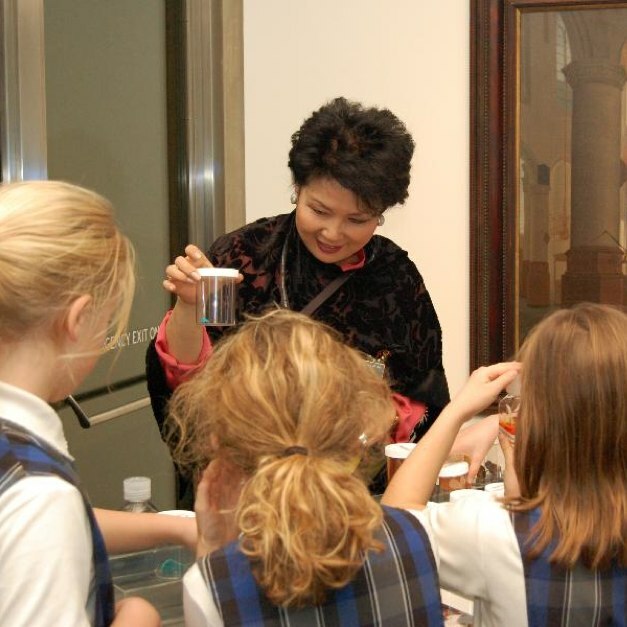 Request a Docent-in-the-School visit when you book your tour. Available on a case-by-case basis for schools outside of Franklin County. For Buses: The Group Entrance is located on the west side of the building. Buses may drop off people on 9th St. in front of the group entrance. We suggest your bus driver drop off people and return for pick-up at the specified time (pick-up is at the same location as drop-off). If your bus is parking at the Museum for the duration of your tour, the bus may park for free on 9th St. (in front of the group entrance), but there is limited parking in this location. If there is no parking available at the 9th St. entrance, there is additional metered parking on Broad St. and Gay St.
For Cars: Cars and vans may park in the Museum parking lot (located off Gay Street on the north side of the building). There is a flat rate of $5 for parking in the East Gay lot. For Buses: Buses may drop off people on Gay St., behind the Museum near the Paul Feeley sculpture (blue, white, and red towers). The group will be asked to walk past the parking lot to the main Museum entrance (new wing). We suggest your bus driver drop off people and return for pick-up at the specified time (pick-up is at the same location as drop-off). If your bus is parking at the Museum for the duration of your tour, the bus may park for free on 9th St. (west side of the Museum), but there is limited parking in this location. If there is no parking available at the 9th St. entrance, there is additional metered parking on Broad St. and Gay St.
To book your school tour, please call 614.629.0342.